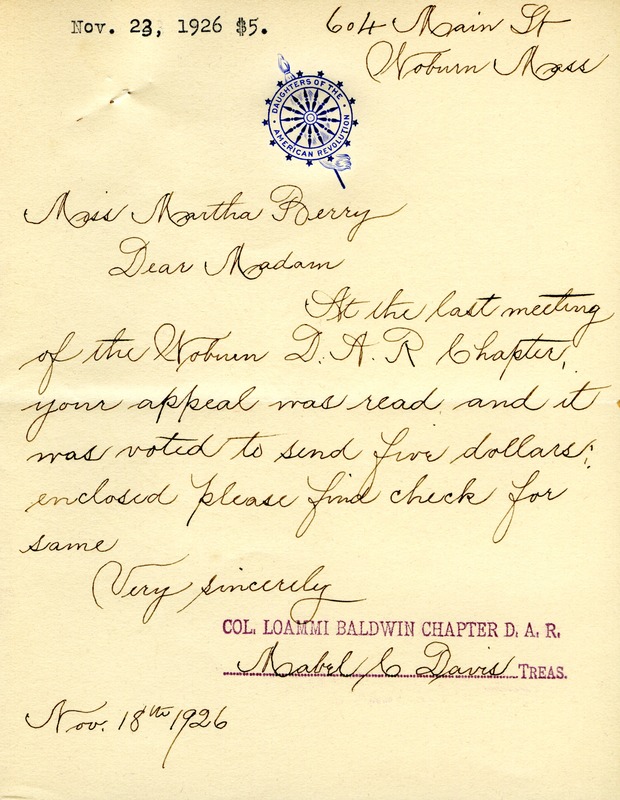 Isabel C. Davis sends a $5 gift in response to an appeal that was read at the last DAR meeting of the Col. Loammi Baldwin Chapter in Noburn. Isabel C. Davis, “Letter to Martha Berry from Isabel C. Davis.” Martha Berry Digital Archive. Eds. Schlitz, Stephanie A., Chelsea Risley, Mandy Tidwell, Alan Henderson, et al. Mount Berry: Berry College, 2012. accessed April 25, 2019, https://mbda.berry.edu/items/show/2101.